We understand that your life is busy. Our office is open Monday through Friday with hours that can accommodate your hectic schedule. We know that your time is important, and we work to ensure your visit is scheduled as professionally and quickly as possible. Street parking is available on Kennedy Blvd and Tampa St. If you would like to park in the Bank of America garage, we do validate for the first hour. Please take Tampa Street South-bound, you will cross over Kennedy Blvd. Once you cross over Jackson Street, be prepared to take the next right onto Washington Street (there is no street sign). Take another immediate right into the Bank of America parking lot. You will see a sign that says "Tampa Club and Bank of America Parking Lot." Drive to the 3rd floor, take a parking ticket, and park above the 5th floor. Once you have parked, take the elevator to the 3rd Floor (Sky-Walk). Cross over the Sky-Walk. We are at the end of the hallway on that floor. If you have trouble finding the office, there is a concierge at the top of the escalators. Thank you and we look forward to seeing you at your appointment. 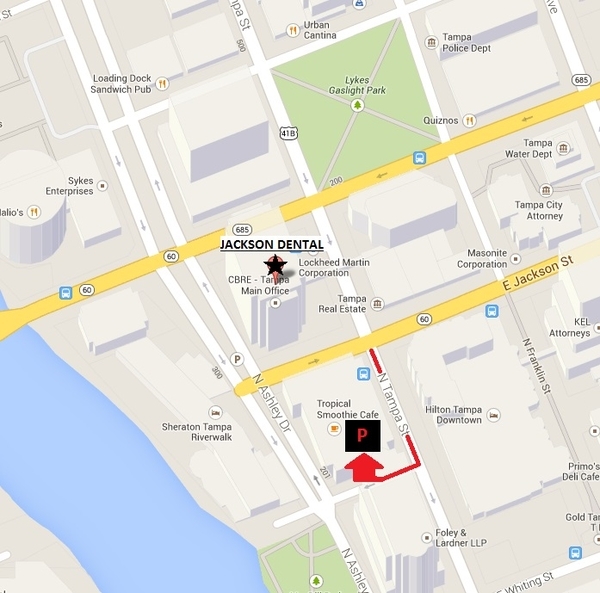 I had the best dental experience by far at Dr. Jackson’s office. His staff was welcoming, caring, and meticulous. His office has the most recent equipment. Dr. Jackson makes a conscious effort to explain what he needs to do, and how he will do it. Will definitely go back!